Our product range includes a wide range of mechanical recovery blast machine room, vacuum blasting machine, cnc blasting machine, edge preparation blasting machine, semi automatic blasting machine and cnc external blasting machine. To meet the variegated needs of our customers, we are involved in offering best quality Mechanical Recovery Blast Machine Room. The offered blasting rooms are made using supreme quality stainless steel which is specially ventilated and illuminated for enclosed abrasive blasting. These rooms come with a quality finish and can be made as per the exact specifications of the customers. The offered product goes through the stringent quality check before reaching the market to ensure its flawless performance. Moreover, we assure delivering these to our clients within the assured time. Blast room equipment is used in a wide variety of industries that require surface preparation prior to the application of a protective coating. The surface of the work piece is cleaned by a mixture of abrasive and high pressure compressed air being directed on to the work piece by blast nozzle. The blast room contains the abrasive being shot at the work piece, as well providing lighting and ventilation for the operator's safety. MEC offer a variety of blast room designs and room configuarations which allow to design a blast room facility uniquely tailored to meet the economic production, safety and environmental concerns of each customer. With a burning desire to preserve and uplift our goodwill as the leading firm, we bring forth a wide collection of Vacuum Blasting Machine. This machine is suitable for different purposes, applications for surface preparation before coating and needs only one man to operate. We manufacture this machine by using premium quality components and the latest technology in compliance with ISO 9001:2008 set norms. After considering clients’ different choices, we provide this machine in numerous specifications to choose from. MEC offer portable dust free abrasive blasting equipment with high vacuum power and efficient separation for abrasives & debris. MEC vacuum blasting machines are suitable for different purposes, applications for surface preparation before coating and needs only one man to operate. The blasters are based on pressure vessels in combination with compressed air filters and pressure regulators that ensure sufficient speed of blasting operation in a dust free environment. Abrasive is automatically and instantly recovered for reuse. No flying dust & abrasive to contaminate surrounding. A special valve on pressure vessel allows to work with a blasting pressure as low as 1 bar and as high as 7 bar with the same machine. Vacuum blasting technique can be used on delicate blasting jobs where blasting on low pressures is a must. All MEC vacuum blasting machines comes with a standard special lightweight blast head, blast and vacuum hose assembly, as well as a set of brushes to treat flat surfaces. The very special fibres used in brushes ensure best performance and economy. Being a well established organization, we bring forth an excellent assortment of CNC Blasting Machine. The machine offered by us is appreciated due to its high performance and is well known among our clients who are situated across the nation. Offered machine is manufactured from premium quality components and advanced machines as per the ISO 9001:2008 set norm. 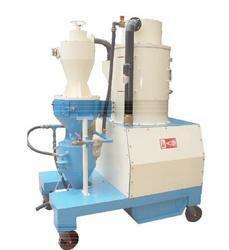 We provide this machine in numerous specifications in line with clients’ diverse choices and in a limited time period. By keeping track with the latest market development, we are engaged in providing an optimum quality Edge Preparation Blasting Machine. Our patrons widely acclaim these machines for their hassle free usage, rugged construction and exceptional performance. The offered machines are fabricated using supreme quality material procured from reliable vendors and utilizing ultra-modern technology to meet the standards set by the industry. Further, we guarantee timely delivery and best price of our products in the market. We seek immense pleasure to bring forth a comprehensive array of Semi Automatic Blasting Machine to our valuable clients. The provided blasting machines are extensively used in heavy-duty applications. This machine is made in tune with the set industry norms and offers hassle free operation. Our team of adroit professionals stringently check this machine on several predefined parameters to ensure their durability and high-efficiency. Moreover, customers can avail them at cost effective rates. 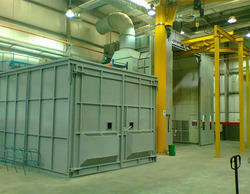 Vacuum recovery unit for collection of abrasive from intricate parts/potion of the job. Delivering the abrasive which rebounds off the workpiece to a central recovery point. Transporting the abrasive from the central point to an abrasive cleaner. Removing dust and other unwanted material from the abrasive before it enters the blast machine to re-use. Backed by the team of skilled professionals, we are offering an exclusive range of CNC Blasting Machine. Our offered machines are widely acclaimed for its superior performance, durable finish, and extended functional life. The provided product is devised using high-quality raw material and employing high-level technology which is in sync with the set industrial norms. Furthermore, these machines are checked on different quality parameters for assuring its flawlessness and are available at economical rates. After deep search of the current market, we have placed ourselves as the notable company of a wide range of Portable Blasting Machine. It is apt for moderate to heavy blast cleaning on structures, pipes and many other objects. Our offered machine is manufactured from well tested components and advanced technology by our skilled professionals. In order to ensure quality, our provided machine is checked against several parameters.